Valentine’s Day is coming up – and what does Valentine's Day call for? Jewellery with hearts on, obviously! Hip jewellery brand Me & Zena sent me this quirky gold necklace with a red heart pencil sharpener pendant, which is from their new spring/summer collection. 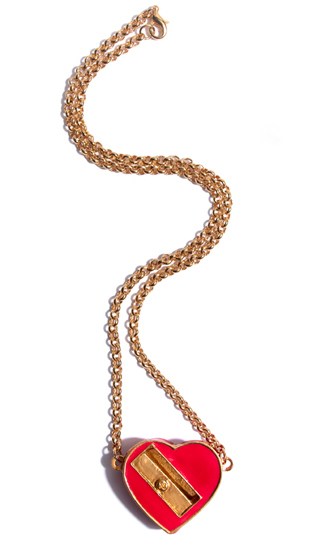 Wear your creative heart on your sleeve with our crafty heart sharpener necklace. We prefer a broken pencil from too much scribbling to a broken heart any day of the week. Available in gold tone with red enamel or silver tone with blue enamel.